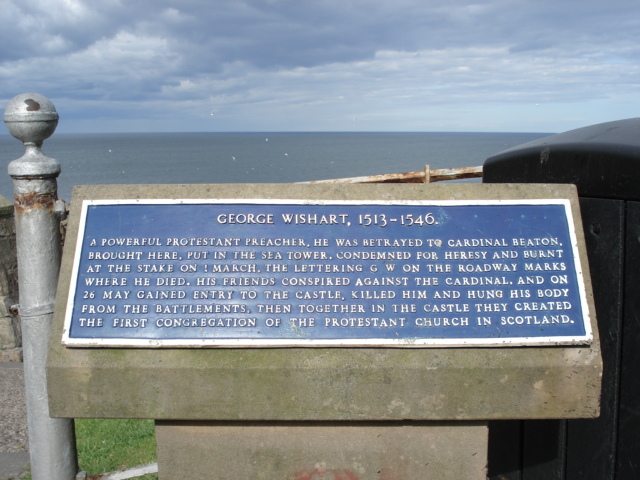 George Wishart, Protestant Martyr, burn at the stake at St Andrews on the orders of Cardinal David Beaton. 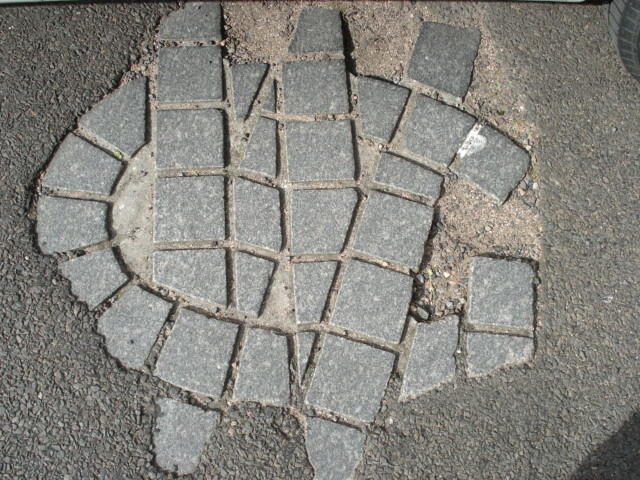 The site is marked by a plaque and the letters "GW" in the roadway. Robert II son of Robert the Bruce's daughter, Marjorie, born in Paisley. William Murray, 1st Earl of Mansfield born. at Scone, Perthshire. 2 March 1808 First meeting of the Wernerian Natural History Society commonly abbreviated as the Wernerian Society, a learned society interested in the broad field of natural history, an off-shoot of the Royal Society of Edinburgh. John Jamieson, lexicographer, whose Etymological Dictionary of the Scottish Language is credited with keeping the language alive, born in Glasgow. Sir John Murray, Canadian Scots Oceanographer born to Scots parents in Cobourg, Ontario, Canada. He moved to Scotland aged 17. Alexander Graham Bell, inventor of the telephone, born in Edinburgh. Sir Henry Raeburn, artist and portrait painter, born in Edinburgh. Forth Bridge opened by the Prince of Wales. Flora MacDonald, who saved "Bonnie Prince Charlie", died at Kingsburgh, Skye. 6 March 1457 In a resolution of the 14th Parliament of James II, convened in Edinburgh, the games of football and golf were banned in favour of archery practice. It stated "..that the fut ball and golf be utterly cryit doun and nocht usit." The Battle of the Alamo,1836, There were four Scots born, Richard W Ballentine, John McGregor (piper), and Isaac Robinson. David L. Wilson and many others of Scots ancestry were among the 189 defenders who resisted a Mexican army of 4,000 who began their assault at 0500 hrs. The Alamo fell at 0630 hrs. Only the non combatants were spared. 6 March 1923 The forerunner of the BBC began broadcasting in Scotland, from Glasgow, as 5SC. 7 March 1744 The Honourable Company of Edinburgh Golfers held their first meeting on Leith Links. The City of Edinburgh provided a silver club for competition which was won by John Rattray. He joined the Jacobite '45 Rising after the Battle of Prestonpans, becoming "Bonnie Prince Charlie's" personal surgeon. He avoided execution thanks to the intercession of Duncan Forbes, President of the Court of Session, a golfing friend. William III died at Kensington Palace after a fall from a horse. Anne succeeded to the throne. David Rizzio, Mary Queen of Scots Italian Secretary, murdered at Holyrood Palace. James Hamilton, 1st Duke of Hamilton died. John Ogilvie SJ, the only Catholic Martyr in Scotland, was executed in Glasgow for saying Mass and for treason. John Playfair, mathematician, born in Benvie, Forfarshire. Soldier and author, Sir Fitzroy Maclean, born. Sir Alexander Fleming, discoverer of penicillin, died. 12 March 1881 Andrew Watson, born in Guyana, son of a wealthy Scottish planter, Peter Miller, and a local girl, Rose Watson, made his first international appearance for Scotland's football team. "HMS VENGEANCE" left Greenock, four months after Commissioning, for the Mediterranean, and thence to join the British Pacific Fleet. John Barbour, latterly Archdeacon of Aberdeen, and known as the father of Scottish Literature, and author of the account of Robert the Bruce, died. The Clydebank Blitz, left 528 dead, 617 injured, and 48,000 homeless, many of whom never returned. Only 7 out of 12,000 houses intact. 14 March 1900 Dame Margaret Kidd QC born at Bo'ness. Scotland's first and, for more than quarter of a century, only female advocate. Called to the bar in 1923 she was the first woman in the United Kingdom to take silk in 1948. She became Scotland's first Sheriff Principal in 1960 when she took charge of the Sheriffdom of Dumfries and Galloway. She was Sheriff Principal of Perth and Angus from 1966 to 1974 and was made a Dame of the British Empire in 1975. John Campbell, 1st Earl of Loudon, Chancellor of Scotland, died. Archibald Menzies naval officer, surgeon, botanist, and artist born in Perthshire. Charles I issued at Westminster a Commission addressed to Archibald, 1st Marquis of Argyll, authorising him to raise a Royal Regiment of 1,500 men to be “led into our Realm of Ireland”. The Regiment was intended by the King to be his Royal Guard, later the Scots Guards. Simon Fraser Lord Lovat, Chief of Clan Fraser, died. He was involved in the formation of the Commandos, the Dieppe Raid and D-Day. 17 March 1291 John Duns Scotus ordained a priest at St Andrews Church Northampton. Rev. Thomas Chalmers, D.D., LL.D. born. He was leader of The Disruption of 1843 when 470 Ministers walked out of the General Assembly in a dispute over the appointment of Ministers to Parishes, and thereafter of the Free Church of Scotland. Raising of Lord Leven's Regiment, later The King's Own Scottish Borderers. The Regiment was raised for the defence of Edinburgh from the Jacobite Rebellion being lead by James Graham of Claverhouse, "Bonnie Dundee", and first saw action at the Battle of Killiecrankie. They served for 317 years with distinction until 2006 when they were merged with The Royal Scots in into "1 Scots", the 1st Battalion of The Royal Regiment of Scotland. Alexander III died, and was succeeded by Margaret, Maid of Norway. 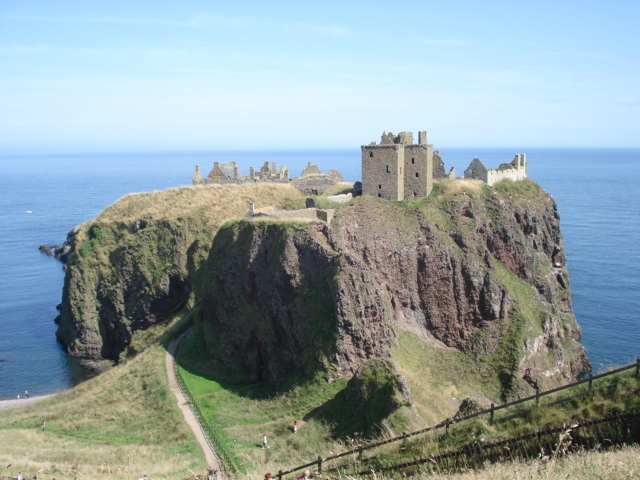 He died when his horse stumbled and he fell from a cliff at Kinghorn in Fife. Lieutenant-Colonel George Johnston born in Annandale, Dumfriesshire, he was briefly Lieutenant-Governor of New South Wales, Australia after leading the rebellion later known as the Rum Rebellion which deposed the Governor, William Bligh. He died on 5th January 1823. David Livingstone born in Blantyre. Famous Missionary and African Explorer, doubts on his whereabouts brought about Henry Morton Stanley's Expedition to find him and the well known question "Dr Livingstone, I presume?" Malcolm IV "The Maiden" born. John Law, economist, known as the "Father of Finance", and the initiator of paper money, died. Buchan defeated English forces at Baugé in Anjou. Captain William Cargill, a veteran of the Peninsular War, arrived at Otago Harbour, New Zealand and was soon joined by Thomas Burns, nephew of Robert Burns, the Poet, who was appointed Minister to the settlement. The Union of Crowns. James VI of Scotland accedes to the English Throne and becomes James I of England. Kenneth III killed by Malcolm II. Robert the Bruce, Earl of Annandale, crowned King of Scots at Scone in the presence the Bishops of St Andrews, Glasgow and Moray and the Abbot of Scone, and the Earls of Atholl, Lennox and Menteith by the Countess of Buchan as representative of the Clan MacDuff. 25 March 1707 The Scottish Parliament adjourned, and met again on 12th May 1999. James Hutton, father of Geology, died. Robert II crowned at Scone. James VI died in his 59th year, the Stuart Monarch who united the Kingdoms of England and Scotland, he returned only once to his native land after acceding to the English Throne. He became known as the "Wisest fool in Christendom. Among his many achievements was the "Authorised Version" of the Bible, the first freely available in English, and still used today. 27 March 1943 "HMS DASHER" exploded in the Clyde during a training exercise with the loss of 379 lives. A Royal Warrant issued at Whitehall to raise Scotland's first Infantry Regiment, The Royal Scots (The Royal Regiment), 1st Regiment of Foot, and served with distinction for 373 years. The Regiment was merged into the new Royal Regiment of Scotland this day in 2006 as "1 Scots", and were joined on 1st August by The King's Own Scottish Borderers to become the "Royal Scots Borderers" Battalion of the Royal Regiment of Scotland. 29 March 1828 William Drummond, 4th Logiealmond, Privy Counsellor in Rome and Minister to the King of Sicily, died in Rome. Edward I of England sacked the Scottish town of Berwick and his army slaughtered its inhabitants. It was re-built by the Northumbrians changing hands a further twelve times up to 1482, and has been English ever since. In 2008 the town voted unofficially to be returned to Scotland, a move which was also debated in the Scottish Parliament. James I captured by the English on his way to France. 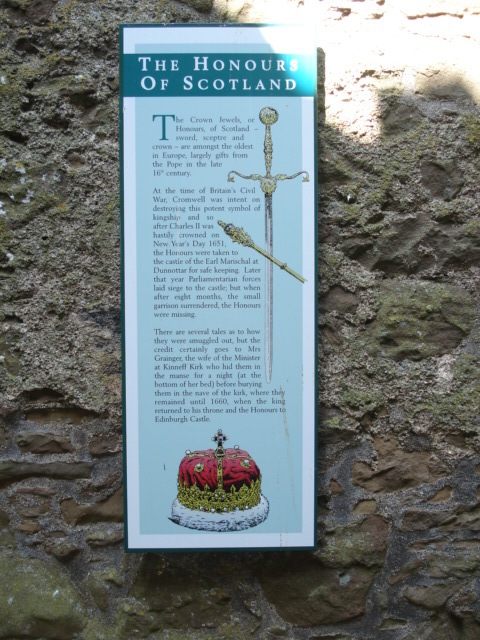 Honours of Scotland saved from Cromwell's forces at Dunnottar Castle by Mrs Grainger, the Minister's wife from Kinneff.